n this July 25, 2017 photo provided by Lisa Cholnoky, U.S. Postal Service employee Joan Tehan poses with Cholnoky as she holds up one of the 535 buttons she is sending. MINEOLA, Long Island -- All she is saying is "give decency a chance." 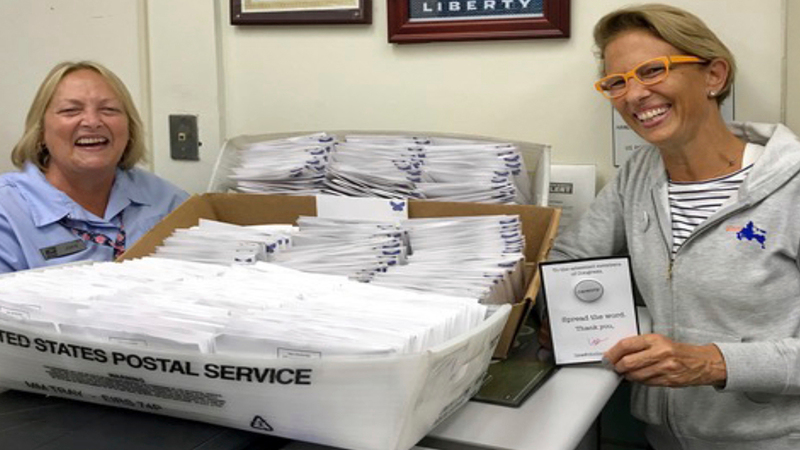 Before leaving on a summer vacation exploring the United States late last month, New York graphics designer Lisa Cholnoky dropped 535 letters at her post office, one for every member of Congress. Each contained a tiny white button containing the word "decency." She says it's the start of what she calls a "Campaign for Decency," aimed at restoring a sense of respect and dignity to American political discourse, one button at a time. "I've been shocked by the number of friends, family and neighbors who share their stories of broken friendships and families divided because we have lost the ability to have civil discussions," she says. "The very fabric of what has always been best about American culture 'neighbors helping neighbors, families coming together in good times and bad' is being torn apart." Cholnoky, who lives in New York City but also has a home in Shelter Island off eastern Long Island, says she hatched the "decency" campaign around the time President Donald Trump was inaugurated in January, but says her effort is less about politics than encouraging civil discourse. She says people riding the subway have complimented her on the button, and when that happens, she immediately hands them two; one for the recipient and one for them to pass on to a friend or relative. She initially had 1,000 buttons made, but says she is open to the possibility of ordering more. Asked about the campaign, U.S. Rep. Peter King, a New York Republican, said: "We cannot allow rhetoric to divide families, friendships or communities. We are all Americans." U.S. Rep. Lee Zeldin, a Republican whose district includes Shelter Island, received the mailer a few weeks ago. "Rep. Zeldin has always worked across the aisle in a bipartisan fashion to find common ground however possible to better our community, state and nation," said Zeldin's spokeswoman, Jennifer DiSiena. A spokesman for U.S. Sen. Charles Schumer, a New York Democrat, said he commends anyone who helps "spur action on the critical issues we face across the country.